Pesto: giving goat cheese a run for the money as best thing ever – Elly Says Opa! 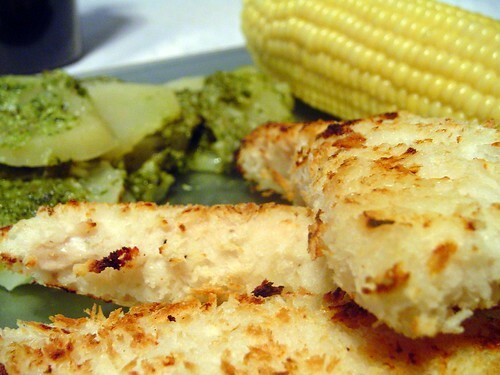 Tonight we had oven-fried chicken strips with pesto potatoes and corn on the cob. Carb-o-rama! And no, we don’t plan on running any marathons soon. Earlier today, I seasoned some buttermilk with salt, pepper and garlic powder. Then I marinated 1″ chicken breast strips in the mixture. You can also just dip the chicken into this mixture, rather than marinate it. And yogurt is a great substitute for buttermilk, if you don’t have it. Both give the chicken a bit of a tang and keep it incredibly moist. Then, I rolled the pieces in panko. I sprayed a cookie sheet with Pam, put the strips on there and then sprayed the top of the strips. Baked in a 375 degree oven for about 8 or 9 minutes per side, and finished them off in the broiler for about a minute. Tom and I both love pesto and we love pesto potatoes. This is a fairly frequent side for us, and after I get my basil plant this weekend, I have a feeling it will become even more frequent. 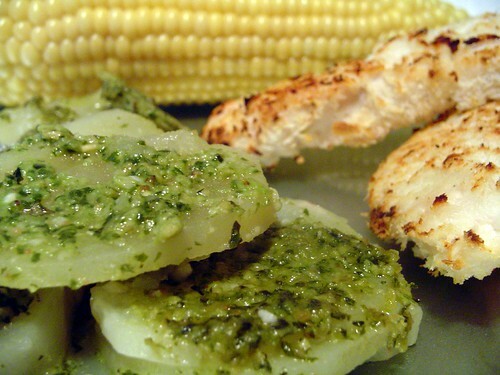 The pesto potato recipe was actually part of my very first vox post! I am going to copy and paste it below so it’s easier, though. Preheat oven to 375 and spray a small baking dish with cooking spray. Peel and slice potatoes in 1/4″ thick circles. Place slices next to each other in baking dish, forming one layer and sprinkle with a little salt, if desired. Top layer of potatoes with layer of pesto. Continue layering, ending with a layer of pesto. Pour chicken broth over potatoes. Cover with aluminum foil and place in the oven. Bake for 25 minutes. Remove foil, sprinkle with parmesan cheese, and bake uncovered another 5-10 minutes. In a food processor, process toasted pine nuts and garlic until combined well. Add basil and parmesan cheese, and process until all ingredients are combined and basil is in small pieces. Stream in olive oil and pulse until desired consistency. Season with salt and pepper to taste.